Rand Fishkin rightly said that a hard thing is done by figuring out how to start. 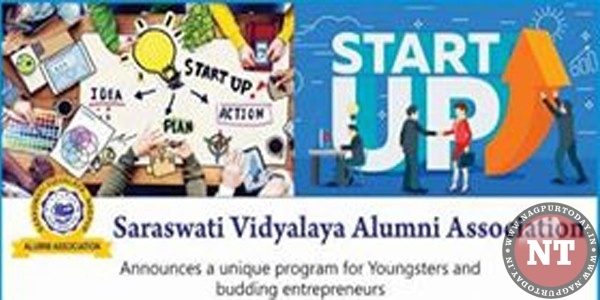 Saraswati Vidyalaya Alumni Association recently announced a unique program on Start-ups for youngsters and budding entrepreneurs from Vidarbha. One has been listening to motivating speeches by Hon’ble Prime Minister to generate a Make in India Crusade. Many youngsters and citizen from all walks of life do want to commence start-ups. But how to go about? All Vidarbhites with ideas and potential who desire to bring in a change can attend this seminar which has been organised by Saraswati Vidyalaya Alumni Association free of cost. SVAA desires that budding entrepreneurs should brain storm and bring a movement in Vidarbha. Any citizen can attend this novel colloquium scheduled on 2nd June 2018 6-8 pm sharp at Jaivik Hall, Orange City Hospital & Research Institute. Topics to be dealt apart from questions and answers during this seminar are How to form a Start Up? Essentials during execution of business? Do and Don’t during execution? & Funding sources for business. The Trainer & Guide for this Start up seminar is CA Rajeev Bhagwat Chand, Founder, General Eduinfra Pvt Ltd who is a leader with an indelible reputation for delivering inventive business strategies and customer focused approach to improve bottom lines. His Expertise is in building profitable start up, new business lines and stream lined business operations. He is known to create high performing teams that consistently achieves in the volatile market. Pranay Tidke@9960954999, Rajendra Kulkarni@9922093855 are the Coordinators who are backing Brijesh Segan@ 9822225776 who is convener of this unique SVAA undertaking. Ashish Khandelwal, Avinash Sahu, Rahul Pande, Randhir Nashine, Mayank Sharma, Shankar Bhavsar, Akshita Vyas, Tejaswini Lohit are members of the SVAA Organising Committee. Shreekrishna Buty- Treasurer, Udayan Shrouti- Secretary and Dr. Anup Marar-President of Saraswati Vidyalaya Alumni Association have implored all Vidarbhites to attend this novel seminar for their own benefit. Only 60 participants will be registered on first come first serve basis.